Apologies in advance for posting this. Both to the Scout Movement which helped shape my life and to the chap himself who is, no doubt, a very decent, fine and honest man. But someone in the editing suite must have been feeling a little mischievous. You see, in the programme Auction Kings, Gallery 63 had been asked to sell an old money-raising poster for the American WW1 effort on behalf of a client. 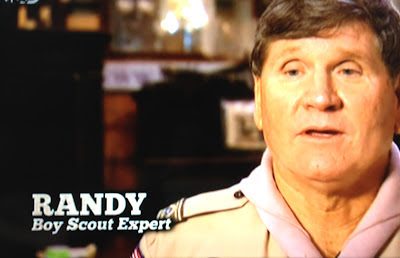 It featured an image of Boy Scouts so the company brought in an expert in Boy Scout memorabilia to help them put a value on it. And, like a lamb to the slaughter, in walks... well, you'll see. I know, I know. I couldn't help myself either.